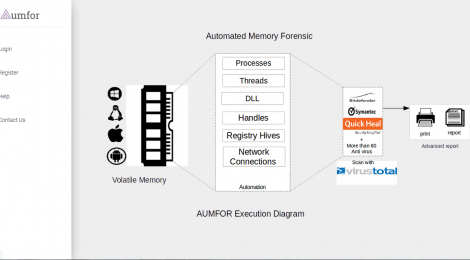 Browse: Home / aumfor – automatic memory forensics. AUMFOR is Automated Memory Forensic is GUI based Tool for helping Forensic Investigator by performing all complex and tedious work automatically, it also analyzes and gives final accurate reports about possibilities of use of malware in committing a crime. AUMFOR is build with Django (Python webframework) and it uses Volatility to perform Memory Forensic. AUMFOR uses VirusTotal for performing Virus Scan feature. ▪ Download a process executable. ▪ Scan a process for viruses using 50+ different antiviruses. ▪ Generate a report (PDF file) of processes contaning process analysis results. ← libinjection fuzzer – is a tool to fuzz MySQL database query to find libinjection bypass.